In a time where so many wines are cosmetically altered and wrapped in a cloak of slick marketing, it’s a delight to encounter three California winemakers committed to transparency in everything they do. But last year, their eighth vintage, heat spikes and a prolonged heat wave adversely affected grapes sourced from vineyard partners. Then in the fall, wildfires prompted Wallace and his family to temporarily evacuate their home. Upon returning to the winery, fermentations had stalled and volatile acidity — detectable as a smell akin to nail polish remover — posed a problem. So the winemaker deployed technologies from a modern toolkit, including reverse osmosis, to tame the wine’s sharp aromas. Ultimately, he produced something soulful and delicious. “It was either stay true to dogma or make the best wine possible with what we had,” he says. An ethos of meticulous care is evident in the approach of Martha Stoumen, who grew up in Sebastopol and now makes wine in Napa. She is a proponent of a “winemaking culture of patience” which emphasizes conscientious work in the vineyard and minimal intervention in the cellar. She elected a series of apprenticeships abroad — in Italy, Germany, and New Zealand, among others — where she farmed and learned alongside esteemed winegrowers. Stoumen’s wines are expressions of her prodigious talent. Michael Cruse, named San Francisco Chronicle’s “Winemaker of the Year” in 2016, is also a force to be reckoned with. The Bay Area native, who makes wine in Petaluma, diverted from a path as a biochemist, intent on crafting something tangible. While his Champagne-method sparklers, called Ultramarine, are near-impossible to get, wine enthusiasts can pick up one of his vivid reds, including a valdiguié-carignan blend, made with the fruit of old-vine, high-elevation vineyards, cultivated by growers he trusts. Cruse Wine Co. “Monkey Jacket” Red Blend 2016 Roasted plum and barrel notes let you know this is a seriously delectable wine. Valdiguié, carignan, and tannat are all a part of this refined blend, generous with red fruit and polished tannins. Around $30. At Streetcar Wine & Beer; Inman Square Wine & Spirits, Cambridge, 617-945-2902. 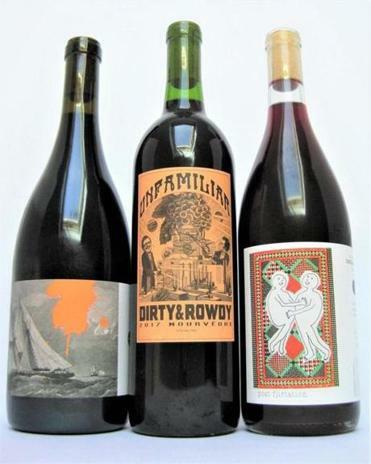 Dirty & Rowdy Family Winery “Unfamiliar” Mourvèdre 2017 Winsome in weight, this blend of mostly mourvèdre offers savory and floral aromas, leading to a joyful palate of cherry, raspberry, and red plum, plus a whisper of tannins and subtle spice. Around $24. At Wine & Cheese Cask, Somerville, 617-623-8656; Social Wines, South Boston, 617-268-2974. Martha Stoumen “Post Flirtation” 2017 This lively beauty is a take-anywhere, sip-with-everyone red. A near-even split of zinfandel and carignan, this quaff offers scents of ripe berries, crushed petals, and a pinch of garden soil. It’s juicy, with gentle grip and exuberant pucker. Around $25. At Streetcar Wine & Beer, Jamaica Plain, 617-522-6416; Bacco’s Fine Foods, Boston, 857-239-8039.